After it reaches Stantonbury Hill, Wansdyke joins once again with the defences of an Iron Age hillfort. Stantonbury Camp, which rises about 60 metres over the surrounding land, lies halfway West Wansdyke and dominates most of the dyke in both directions. From here on can see both Maes Knoll in the west and Odd Down to the east, but also the Avon valley and the Cotswolds to the north. 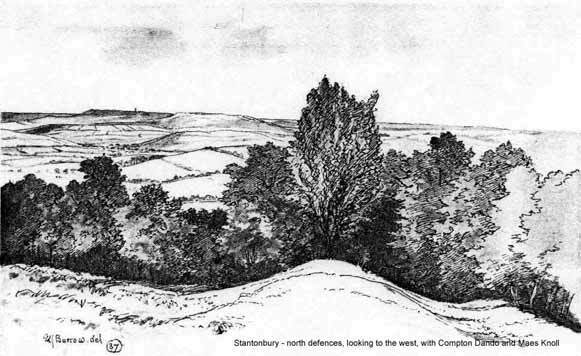 This dominating view has led scholars to believe that Stantonbury was the prime reason for building Wansdyke as far south where it is, not directly controlling the traffic of the Avon valley. If you choose an area of West Wansdyke to visit, I can recommend this one. The Iron Age defences are much reduced today. They may originally have incorporated large stones, some of which can today be seen on the south slope, having fallen downhill at some point. Though I cannot vouch for it, I could imagine that the original defences were torn down after the Roman conquest in the first century. The West Country is known to have resisted the Roman advance fiercely, although this may only have happened in Dorset. This view may be strengthened by the construction of the eastern enclosure. 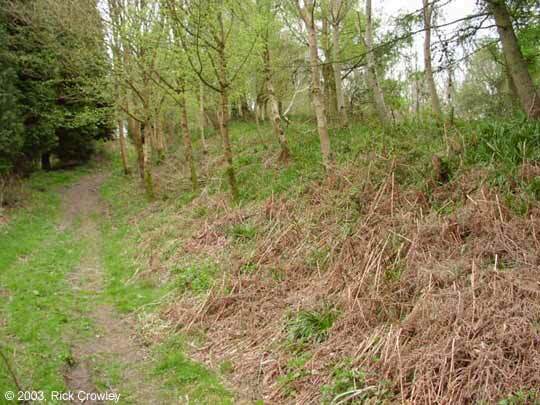 This enclosure has three banks or terraces, which surround the east end, but fade out on the south slope. No defences can be found on the south side, but a further inner bank turns to a parallel course with the north wall. This gives the impression that the three banks once formed a formal entrance to the fort, but that it was never really finished. Could it be that it was constructed as an annexe for newly arrived refugees from the south? Only research could shed light on this question. During or after the Roman occupation, the northern defences were refurbished at some point, probably when Wansdyke was built (below). According to Fox and Fox, the hill top had been ploughed in 1956-7, but the land was turning into wasteland and going back to shrubs in 1960. This is the situation which is represented by the air-photo. 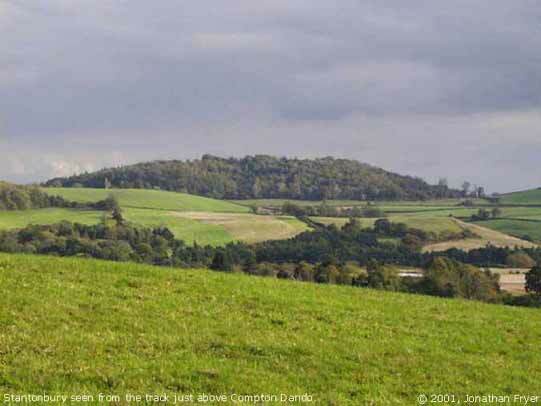 Here you can see the quite overgrown hillfort from the east, with the A 368 in the background. 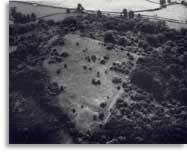 Burrow mentioned that by 1973-4, the top was cleared again, allowing him a better judgement of its defences. I have not visited the site and therefore cant say much as to its present condition. The easiest approaches are from the north-west and the east, which is also where Wansdyke can still be seen. It has been suggested by Fox & Fox that Wansdyke did not actually use Stantonbury Camp, the ditch stopping short of the Iron Age defences by several metres. However, Burrow showed in 1982 that this was incorrect. Although the western slope is much disturbed by quarrying and the lower slopes by cultivation, Wansdyke can still be traced quite well at several points on the hill. As with Maes Knoll, the northern defences are more prominent than those on the south side. As Wansdyke joins the defences here, it can be argued that, as was the case at Maes Knoll, the northern defences were refurbished when Wansdyke was constructed, neglecting the south side which was without use for the builders of Wansdyke. This notion must be strengthened when one considers the old name of Stantonbury, which was Marksbury. This name, going back to an earlier version in AD 941 of Merces burgh or Maerecs burh, is in essence the same as that of Maes Knoll, and means boundary fort. There can be no doubt that both hillforts, used by Wansdyke as dominating viewpoints rather than strongholds, were later clearly seen as part of a border. 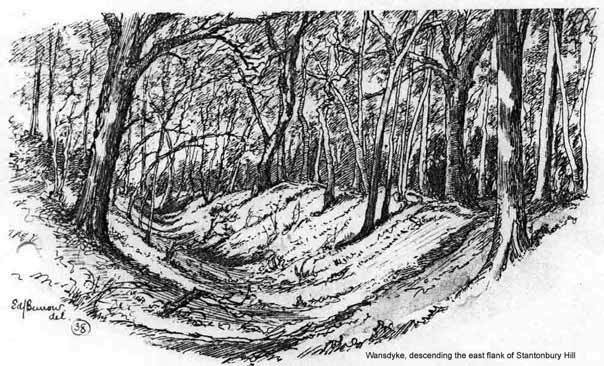 Wansdyke joins Stantonbury at its north-western corner, the ditch and counterscarp ending in the ditch of the northern bank. To me, this suggests that the northern defences were refurbished before Wansdyke was built, and it has indeed been suggested that this section of Wansdyke was added only at a later date. 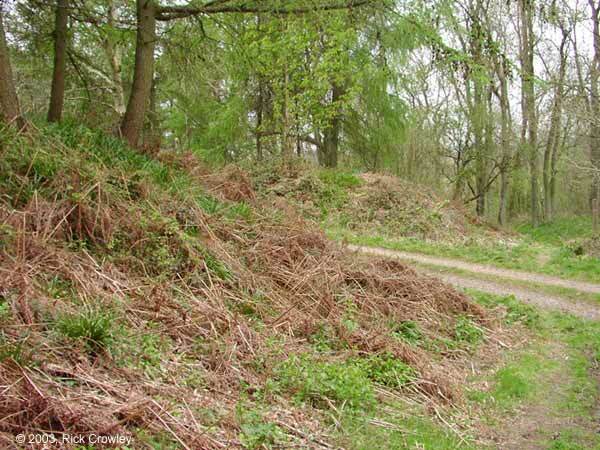 Wansdyke then utilizes the whole length of the northern bank, leaving the fort at the north-eastern corner. Here, it overlies a low bank, but uses a slightly higher bank behind it. Wansdyke leaves Stantonbury from the north-eastern corner, overlaying one of the banks of the eastern enclosure. Stantonbury as seen from Compton Dando. 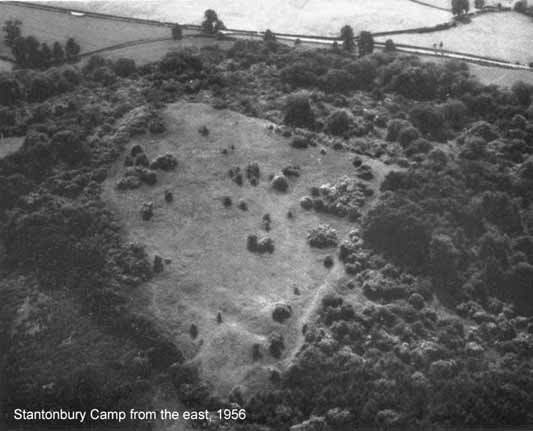 Stantonbury Camp from the air, 1956. Wansdyke at Stantonbury Hill showing Wansdyke with a track passing through it. 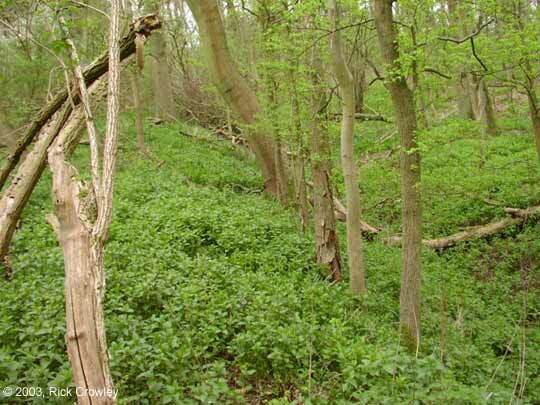 Still at Stantonbury Hill, nearer the bottom of the hill were it is very overgrown. Wansdyke leaving Stantonbury from the north-eastern corner. Wansdyke on the right with trees growing out of it. Directions to Section 3 can be found here. Follow Wansdyke further through Section 4.